Police are investigating after a man was found seriously injured on a Fraserburgh street. 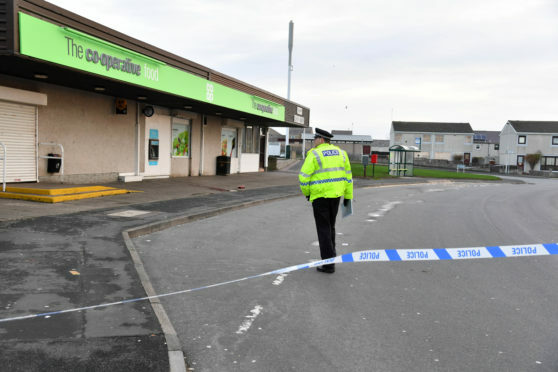 The 30-year-old was found in a pool of blood near the cash machine at the Co-op on Buchan Road late on Thursday. He was rushed to Aberdeen Royal Infirmary, where he remains in a serious but non life-threatening condition. Yesterday, the area remained cordoned off as police continued their hunt for the culprit. One shocked local said they heard two people talking at around the time of the attack, at 10.50pm, but had no idea someone had been hurt. She said: “I heard two folk chatting and all sounded normal. Another local said: “Things don’t usually happen on this street but you never know what’s next here. “It’s worrying as we’ve got kids here and we don’t know what happened. Fraserburgh and District Community Safety Group chairman and local councillor Brian Topping assured residents such incidents were “rare” and wished the injured man a speedy recovery. He said: “Things like this are a rare occurrence if it was a stabbing. “My thoughts are with the man and his family and friends, and I wish him a quick recovery. “You never know why these things happen. “To think someone has been beaten up or stabbed is awful. “People can be angry or upset but there’s ways to discuss things appropriately. Police confirmed they received reports of a serious assault in the Buchan Road and that inquiries are ongoing. An ambulance spokesman said: “We received a call at 10:48pm to attend to an injured man in Buchan Road.